Erna Finley View Condolences - Southampton, Pennsylvania | McGhee Funeral Home, Inc.
Condolence: Our condolences for your loss. Condolence: "Mrs. Finley" was a very important part of my growing up. So many memories, especially of her dedication to her family. Condolences to the entire family. Condolence: Jan and family: I am so sorry for your loss. I will keep you all in my prayers. Your Mom will forever be in your hearts. She is now with your Dad watching over you. Two angels watching over each of you. 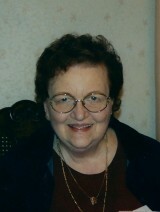 Rest in Peace Erna!